Thank you so much for your support of Peace News. As another year draws to an end, it is clear that Britain and the world need a strong voice for peace and radical nonviolence, more than ever. PN also played an important role in the logistics for George Lakey’s recent UK speaking tour, which saw the veteran US peace campaigner and nonviolent revolutionary speaking in events across the UK, including in Norwich, Sheffield, Glasgow and Leeds. And PN itself has continued to run a lot of content that you would have been unlikely to find elsewhere. Among other things we have published: the story of how migrant workers in Florida used strategic nonviolence to win a victory against US fast food giant Taco Bell; an in-depth account of the experiences of women working in UK co-ops; a unique analysis of The Guardian’s coverage of the ongoing war in Yemen; an essay-length review of ground-breaking labour organiser Jane McAlevey’s memoir, Raising Expectations (and Raising Hell); an exploration of how our movements can help Jeremy Corbyn to stay radical if he’s elected; the first in our series of conversations with working-class peace activists; a look at so-called ‘deep canvassing’ techniques and how they can be used to combat prejudice in our communities; and on-the-spot reporting from the trial of disarmers Sam Walton and Dan Woodhouse (see the front page of our current issue). Our Winter appeal this year is raising money to reach out to more activists, especially those isolated or spread out across the UK, or without local groups, by providing more access to inspiring information, skills and networks. Your donation will help us bring people together to work for a nonviolent world. 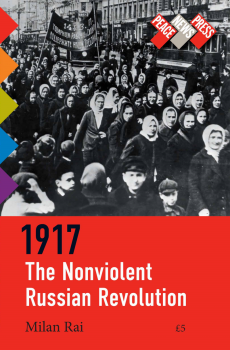 We are planning to hold a nonviolent resistance gathering to develop skills and confidence, supporting participants in becoming more powerful campaigners and strengthening the network of people committed to developing active nonviolence. We also aim to raise enough money to offer travel and participation scholarships and a sliding scale for registration to make the gathering as inclusive as possible. Other important work for next year includes redeveloping our website so make it as useful and user-friendly as possible and, of course, to continue with our day to day work of recording and supporting the grassroots movement for peace and social justice in the UK. Please contribute generously to enable us to fund our nonviolence work for 2018. * Milan has already spoken at three events in London, and upcoming events are already in the pipeline in Crawley, Hastings, Abingdon and Brighton. Contact promos@peacenews.info or 0207 278 3344 if your group would be interested in hosting an event with him. Alternatively, you can send a cheque (made payable to 'Peace News Ltd') to Peace News, 5 Caledonian Road, N1 9DY, or make a bank transfer: account name: Peace News Ltd No. 4 / Sort code: 08 90 33 / Account number: 50424542.